Weather: Warm, overcast but dry. and all plants were in their first year. It was a much awaited day, where the British Hemerocallis & Hosta Society came to judge the Hemerocallis, They couldn't have picked a better day, overcast but warm & dry, most of the Hems had come into flower just over a week ago. 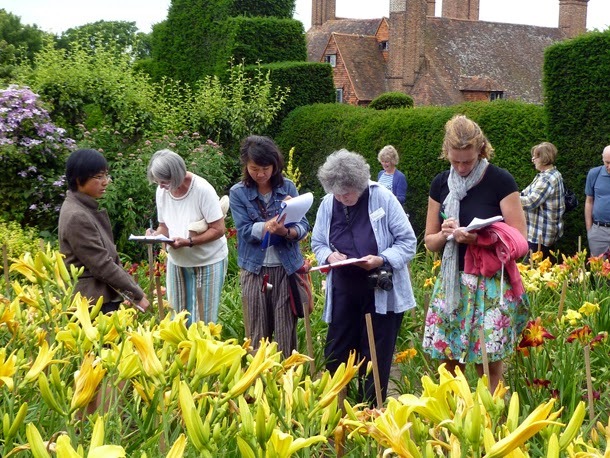 The RHS Herbaceous Perennial Committee had separately come to do their meeting and it was interesting how their judging criteria are different. The BHHS society set about deadheading the flowers as they felt that they needed to be seen in the best light, whilst the RHS committee group felt it was important to leave the dead on the plants, to see how they die. I agreed that the dead should be left, as it did make a difference if they quietly shrivelled and dropped off, or melted like a flaccid balloon in a horrifyingly showy way. Also to see if flower colours faded early. But I feel both methods are valid can be accommodated in one trial, and the Hemerocallis did look a lot better deadheaded. It just went to prove that working out what set of criteria you chose to judge and measure a plant was important and not straightforward. 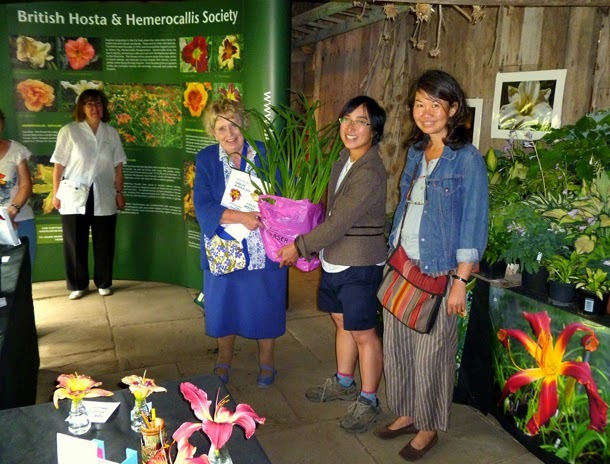 Being presented the almighty Hemerocallis 'Barbara Alsop' and receiving on behalf of Fergus & Dixter. It was one of those days that I learnt a lot through listening - what made good flowers - spacing of scapes (flowering branches) were important. How they held themselves above the foliage. The different trends of flowers. Producing red flowers have been one of the latest achievements of breeding, it was good to consider if the throat of your plant was green and yellow, as that can make a difference to how it offsets a colour, another plant when used in the border and in combination with other plants. How there have been moments that indentations or textures on a flower has been all the breeders rage. The latest trend is producing spider type daylilies with 'teeth' (indented edges). Then there are terms diploid, tetraploid and triploid used for daylilies, which basically define how much chromosomes they have and is significant to a breeder. Diploids have 22 chromosomes, tetraploid 44 and then triploid have triple that amount. The more chromosomes they have - the more they can do to it - so this is where breaks in colours, two tone and extra frills for example is able to be possible. Triploids though is rare because they are usually infertile and cannot be pollinated.